We stock an excellent selection of dog feeds from many reputable brands to suit all ages and breeds of dogs. This selection includes our top quality and excellent value own label range - Columbard Premium, Columbard Naturals and Columbard Grain Free. This range is veterinary approved and highly recommended by many of our customers. We also stock a variety of frozen meats which are listed in more detail on our Raw Food page. Our own label Grain Free range comes in an excellent variety of flavours and at 50% to 60% meat,depending on the variety, it has a much higher meat content than many other grain free brands on the market. This range is at such a sensible price - £42.00 for a 15kg bag - it has become very popular indeed with our customers. To compliment our raw and grain free feeds we also stock a good selection of grain free treats and rewards. Whatever your dog’s dietary requirements are, whether they need to watch their weight, have a sensitive tummy or are just fussy eaters please call in and we will be glad to help you find the most suitable product. We have lots of natural treats for your dog including pigs ears, snouts, black puddings, roast bones, fish chews and many more. We also have a large selection of packaged treats, rawhide treats, grain free treats and vegetable treats. Many dog health & well being products, dog beds, coats, bowls, collars, leads and toys always in stock. 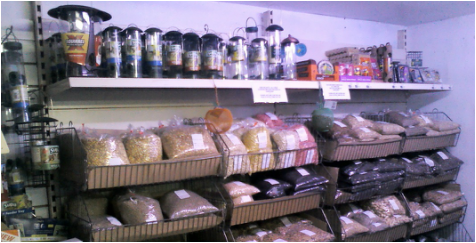 We have an excellent choice of feeds, bedding, treats, toys, cages, hutches, runs and very much more kept in stock. 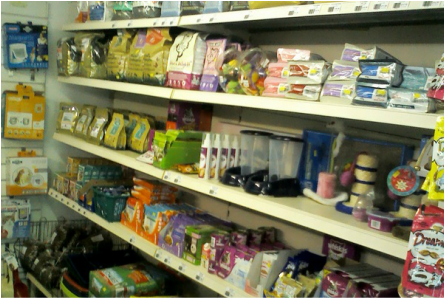 Whatever your pet needs please come and see us and you will find we have plenty of choice of products. We also stock a range of health and hygiene products for your pet and their accommodation. All our bird feeds, including chicken feeds, plus many of our small animal feeds are available in handy, small quantities which we have weighed up and bagged ready for your convenience or they are available in full sacks which we are always happy to carry to your car . Live and frozen reptile feeds are also kept in stock. Our selection of wild bird feeds includes no mess mix, sunflower seeds, sunflower hearts, suet pellets, logs and blocks in various flavours, chopped peanuts, whole peanuts, peanuts in shells (monkey nuts), songbird mix, nijer seed, dried mealworms and live mealworms. All are available in in handy, small quantities which we have weighed up and bagged ready for your convenience or they are available in full sacks which we are always happy to carry to your car. We also have a selection of feeders for all of these feeds plus feeder stands, bird tables, houses and nesting boxes. We stock an excellent selection of cat feeds from many reputable brands to suit all ages and breeds of cats. This selection includes our top quality and excellent value own label range – Columbard Premium, Columbard Naturals and Columbard Grain Free. Whatever your cat’s dietary requirements are, whether they need to watch their weight, have a sensitive tummy or are just fussy eaters please call in and we will be glad to help you find the most suitable product. Many cat beds, toys and treats always in stock. We have both Tropical and Cold Water fish in stock with a full range of everything needed to help you keep them and your aquarium in top condition. Feeds, aquariums, filters, lights, fish health treatments, water treatments, a selection of colours of aquarium gravel, real and artificial plants, aquarium ornaments and many more accessories are kept in stock. From spring until autumn we have a variety of seasonal plants and stock a small selection of useful garden accessories. Locally produced organic compost and gro-bags are also stocked. 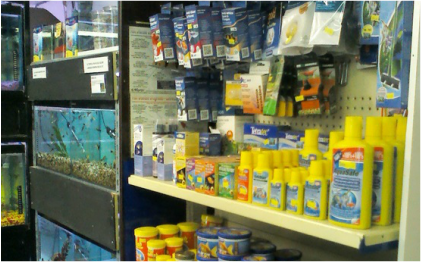 We stock a range of treatments for ponds plus a selection of pond fish feeds.